Brett just found out that sci-fi icon Forrest J Ackerman has died. Because of his interests, Brett knows much more about "Uncle Forry" than I ever will, but I do know that he was a gracious and genial host when we visited his home back in 2006. 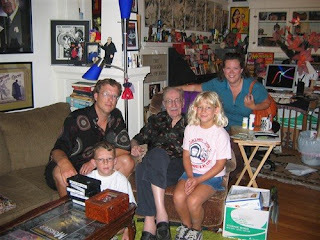 We're sad to hear of his passing, but we're grateful we had a chance to meet this man who gave us Famous Monsters of Filmland and made many other contributions to the entertainment world.